The Pennsylvania & Southern Railway provides seamless and timely transportation solutions for businesses located in the central Pennsylvania, western Maryland, and northeast West Virginia region. 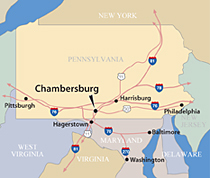 Operations are based at the Cumberland Valley Business Park in Letterkenny, Pennsylvania, and extend along our mainline to nearby Chambersburg. Our route features extensive infrastructure, easy highway access, and hundreds of acres of available space. Take a look at how the Pennsylvania & Southern can help your business succeed by providing solutions to your logistic challenges. At the Pennsylvania & Southern, we believe in providing specialized services that meet our customers’ specific transportation, storage, or distribution needs. Our focus on the customer results in a level of service that is unequaled by larger railroads. We offer on-demand switching for critical shipments, easy customer access to inventory data, on-site 3PL services, and help coordinating transloading and trucking services. Specialized infrastructure can efficiently handle all forms of material – from paper, to plastics, to TOFC and automobiles. Customers can also benefit from specialty IT and manufacturing services provided through the Cumberland Valley Business Park and Letterkenny Army Depot. The Pennsylvania & Southern has some of the largest reloading, transloading, and long and short-term car storage capabilities in the Northeast. Our 30 miles of track includes two 250–car capacity storage yards and five mile long mainline. Transloading tracks hold 100 cars and are easily accessed by road. Six heavy-duty ramps enable us to handle intermodal or industrial/farm machinery on flatcars. Acres of paved lots serve as reload and lay-down areas. Our route from Letterkenny to Chambersburg features over 100 acres of developable, rail-served, zoned-industrial land. All track is 286,000# compliant. The Cumberland Valley Business Park offers businesses all of the components needed for success - a highly developed infrastructure, easy access, economic incentives, and room for expansion. The park is situated on 1,200 acres of land and includes more than 1.2 million square feet of space under roof. At the Pennsylvania & Southern, we’ll work with you and the park to identify the location that best suits your warehousing or distribution needs. Whether you require a site with direct rail access, or prefer to transload from one of our facilities, we have the location that will allow your business to succeed. Able to handle a range of products: paper, plastics, steel, building products, food grade, and more. 21 food and paper grade buildings. Able to handle grain, feed, plastics, forest products, steel, paper, heavy equipment, and automobiles. 400 acres of outside storage. Rail infrastructure able to handle unit trains. The Pennsylvania & Southern Railway is conveniently located along Interstate 81, and in close proximity to I–76 (Pennsylvania Turnpike), I–70, and U.S. Routes 30 and 11. This quick highway access allows products to be moved by truck to one third of the major U.S. markets within one day. Our Class 1 interchange partner CSX provides the reach and strength for shippers to access all of North America, including major east and west coast ports. The Harrisburg International Airport and Hagerstown Regional Airport are less than 50 miles away.